"DON'T GO DOWN THE BASEMENT!" When it comes to horror, it’s a common phrase Usually, there are some dark and disturbing things that shouldn’t be uncovered down there. Yet, in The Basement, premiering on digital from Uncork’d Entertainment, that lowly place is EXACTLY where you need to be. AND IT IS BECAUSE THERE ARE DARK AND DISTURBING THINGS DOWN THERE. 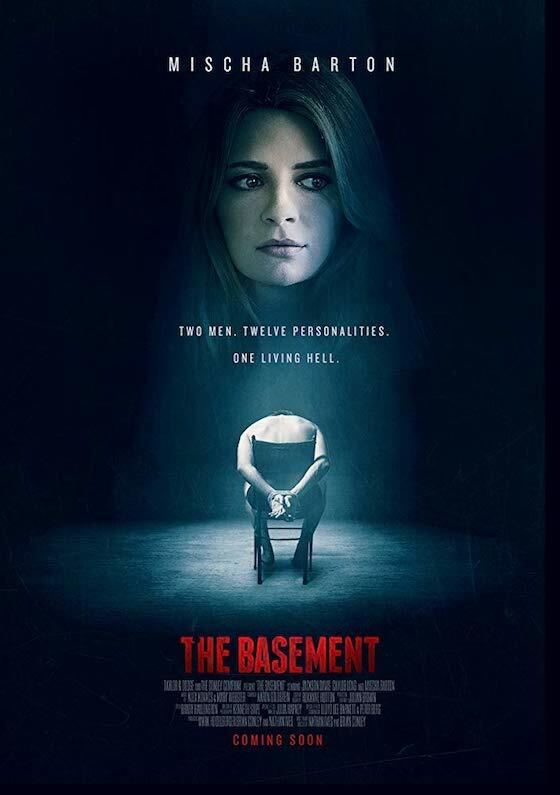 Led by a MAD performance from Jackson Davis as a deranged serial killer who loves to role play with his victims, The Basement is an interesting take on the horror genre. Musician Craig Owen (Cayleb Long) and his girlfriend Kelly (Mischa Barton), at the beginning of the movie, seem to be happy. Appearances are deceiving, though. "It's not a perfect film but it is a shocking one, unfolding in a very surprising manner if you aren't paying close enough attention"
And, when tasked to go to the store to get more champagne, we see the first glimpse of their problem: an affair. It arrives via text. Uh oh. Craig has been unfaithful. But there’s a change. He actually deletes the text and the photo attached. Good move, Craig. And then, because the universe is unfair, he is taken hostage by “THE GEMINI” (Davis). The poor dude will spend the rest of the movie in a basement. It’s not like Kelly doesn’t notice that her lover doesn’t return. She phones a friend to help her out. Where could Craig be? Let the TAUNTING begin! 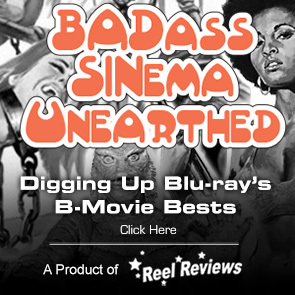 With keyed-in cinematography from DP Kenneth Stipe and solid gore effects, The Basement is a film you will want to see to its conclusion…if only to confirm your suspicions. The film, thanks to solid performances and good production values, works to create a spicy swig of rum-barreled horror for this fall’s festivities. It doesn't disappoint. 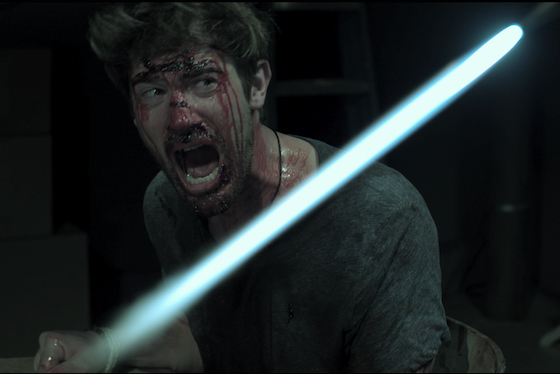 Directed by Brian M. Conley and Nathan Ives, The Basement works because of the in-the-moment acting skills of Davis as he tortures Craig, reenacting a past with a wide array of characters in his background. His commitment to bringing The Gemini to life is to be commended. The dark story is strong for its 90-minutes, but it is Davis’ skills and Long’s reactions to the NONSTOP mania that really brings it on home. Had lesser talents been in these parts, the movie would have fallen apart all too quickly. Davis starts as the threat he REALLY is by chopping off some fingers. One. Two. Three?! OUCH. And then he appears as a doctor. A lawyer follows. Then a deputy and so on. Each time he goes up the stairs, leaving Craig bound to a small student desk in the basement, he comes back down as a new character and the violent jeer – the role playing, that is – begins again. Meanwhile, Kelly and her friend (Bailey Anne Borders) – from the privacy of Kelly’s house – call the cops concerning Craig and talk about his past affairs. These conversations begin strong enough, giving viewers a break from the brutality in the basement, but they fall away – because her friend nods off – all too quickly. Barton needs more to do; not just an epilogue to shine. For that matter, so does Miss Borders. Both look the part for the movie, but give them more to do. PLEASE. The Basement will be MOST appreciated by all the Horror Hounds and Gore-Gore Girls out there thanks to the amount of on-screen violence on display when it goes for the throat. It's not a perfect film but it is a shocking one, unfolding in a very surprising manner if you aren't paying close enough attention. It is now in a limited theatrical release in this country. Once the door opens, there’s no telling who will come down the stairs in The Basement. Memorable Movie Quote: "Forgive me father, for I have sinned. I have killed seven people." Synopsis: A seemingly innocent man is abducted by a notorious L.A. serial killer, who forces his victims to switch roles with him so that he can enact his own capture, torture and murder.